THERE'S POWER IN MY PRAISE-THERE'S POWER IN MY PRAISE! My Sisters and Brothers Start to Say this over and over until you believe it!! amen. I know It Works! Greetings to you children of the Most High God, I come in the name of Jesus! Jesus said about Himself that, He Is The Way, He Is The Truth and He Is The Life. So these are some of His names. The Way, The Truth and The Life. Are you using His name to Praise Your Way Through Every situation and circumstance? Praise is a way to confess with your mouth the truths about God. That YOU KNOW that God is going to take care of all parts of your life. That you KNOW He Will show you the way. You are letting God know that you trust in Him, that you are relying on Him, that you are abiding in Him and that you are waiting on Him to show you what His Will is for your life. When you are trusting in God and showing you have faith in Him--you are showing God how much you Love Him. Glory To God! Lord We bless Your Name! Hallelujah! You are confessing with your mouth what your heart knows to be the truth about God = That when we come to God, to draw near to Him, He will make known to us what His will for us is. That once we know this, we will be true to His vision for us. With our mouths we praise Him with His truths that we believe. We should KNOW this = That God will put the desires in our hearts that we should want-then He will give us the desires of our hearts. We should KNOW this = Therefore Father God, our hearts are Glad and our Glory Rejoices and that our flesh also SHALL Rest In Hope that Comes From You in the name of Jesus, amen! Teach yourself this = Father God, In the name of Jesus, I Will With my heart treasure Your Promises! amen. When you have made up your mind to follow Jesus Everyday, you have stepped out of the boat. And you are walking on water. This also means that you are not within your comfort zone anymore. Your emotions and feelings are going to start screaming that you go back to what you know, which of course, is not working for you. Be a person of responsibility and a person of action. Put your faith to Work for you. That is what it was created to do. To float you through all situations just like a life preserver was created to do. Lift your head above the deep waters when there is no land under your feet. When you step out of the boat--and start to confess your faith--putting it into Action, you begin to see the opportunities that God has created for you to partake of. A more aggressive attitude to do RIGHT AWAY--what God has said to do. God is truth, He does not compromise. His anointing is not in the past. If you are going into your past thinking on past 'things', I pray that you are remembering the times that God was right there bringing you through that past. His anointing is on today! RightNow! Use the memories of your past to Give God praise and thanks giving for bringing you Through to today! amen. Speak Truth to Power!!! PRAISE YOURSELF THROUGH--ALL YOU HAVE IS NOW! PRAISE HIM--RIGHTNOW! YOU HAVE NO CHOICE BUT TO VOICE THE TRUTH OF GOD CONCERNING YOUR LIFE! HALLELUJAH! GLORY TO GOD! Let me speak this truth of God from my heart over you right now = "I Pray that you may be active in sharing your faith, so that you will have a full understanding of Every Good Thing we have in Christ." in the name of Jesus I know this to be the truth! amen. "Fear Not, for I have redeemed you [ransomed you by paying a price instead of leaving you captives]; I have called you by your name; you Are MINE! When you pass through the waters, I Will Be With You, and through the rivers, they Will Not overwhelm you. 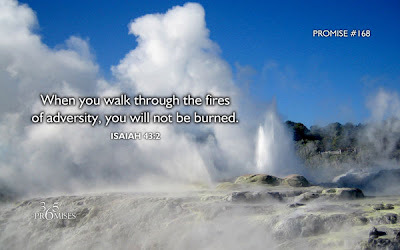 When you walk through the fire, you Will Not be burned or scorched, nor Will the flame kindle upon you! FOR I AM THE LORD YOUR GOD!" Ok, now let me tell you a little about the title to this message. Some of you that visit here know that in September of 2006 God told me to leave my career of teaching. And I did - right on the spot I resigned from teaching art in public school after 18 years. I cashed in all my accounts and paid off some bills, lived on some of the money and gave the rest away to the people God told me to give it to. Since then, my partner and I have been living off her salary and The Favor of God over our lives--and we have not lost anything, gone hungry, or gone without clothes or food for our children. Because of my daily spiritual growth in Jesus and the daily growth of my relationship with God-- I know I am going through a fair amount of tests that have been allowed by the Will of God for my life. Tests that include situations and circumstances in which We can't go or depend on anyone but God to have our backs. Tests that offer lessons of truth about the people you thought were your good friends and family and how you know they remember ALL the times you were right there for them-never missing a beat as a friend of theirs. You still love them and depending on what happens--you may be there for them again. See, if the tests are completed correctly- by yielding to the Power and Will of God-you will also learn Truth about yourself. Tests that give you the wisdom from experiencing people you thought you heard them say they were your brotherfriend and /or sisterfriend and they would be with you through thick and thin--but when you called on them for help, they offered none throughout the conversation and avoided your next call. And you are thinking, I did hold up my part of the relationship didn't I? But if you glean the situation you will find knowledge about yourself you never knew was there...within you. The Tests that build-tear us down and build us back up, are allowed by the Hand of God. The Love of God re-creating us into what His original design purposed! Glory to God. Thank You Jesus for Your Love of God SAVED my life! Glory be to God! And there are times as it was the other day, where I start praising My Father God for taking care of all our 'issues' and all the concerns of my heart. You know that you have to Praise and Thank God for what you cannot see yet. The other day I was thanking Him in the name of Jesus for paying-(giving us His financial resources as our natural sight sees none)- a few bills that have come due before we get what 'man' has to give us. You see, man is always late lol, compared to God. Amen. ????? I am quite unaware about this, as most people do not just drop by our home...I do like to get a call first. So I go to the door and open it and see it is one of the young men that lives with his father from next door. (i had to call the fire dept to put out a kitchen fire there last month). A man-a father rents there and I know he has his 2 grown sons living with him. Now I would say they are about 19 and 20-some. I also know the fathers girlfriend (Ms P.) from long ago. So this young man-who is the younger son-is asking me do I know Ms. P? I answer yes, for many years I've known her. He says she wants to talk to you-will you come to the fence? (yes it is our fence). OK, let me stick a pin in this right here! lolo--Now, in my head I am saying Lord, is this You? What is this? I am thanking you for taking care of these bills -- we need some cash Please-Thank You--and You have sent me another little person that I will be responsible for...??? LOLO--God knows what He IS doing! amen. Now, you know with the little girl standing right there listening to Ms. P and I talk, I could not say NO!! I quickly said in prayer to God--as I am telling them to change her clothes so she can get into the pool--God, Lord, no matter 'who' is sending me this child, I am giving YOU this situation and asking You= what am I to do? In Jesus's name Amen. See, you have to be very aware of the evil of satan. I was not sure if he sent this little girl to me to add to my work-to distract me, or if God sent the little girl so we could give her the overflow of The Love Of God that this family has living in our hearts. I gave the situation to God as He is All Knowing and He directs my steps. Amen. No matter 'who' sent her -- I put her in His hands. So now I had 4 little girls to watch and tend to on that day. Now Don't get me wrong--I love children--but for this child to 'pop up outta the blu!' As I am praising and thanking God for providing in abundance for His Family here--was nothing but God saying to me... My Child, don't think on your circumstances--take care of this little one, think on her for Me and I Will go and take care of the concerns of your heart. So that is the gist of how I got the title for this message. I am still tickled by all of it happening. My point is--if you have not gotten revelation yet-- is, give your concerns and situations to God in Jesus' name and do what He is calling you to do for Him. He will take care of your problems as He is Greater than Any problem any of us could possbily have! Amen. We are in need of--and God sent us to help another as there is nothing we can do to help ourselves = but to help others! Has it hit you yet? ! I know it has...It is good isn't it!? Glory to God-Amen. Come on now, I will join you and you can join me in PRAISING OUR WAY THROUGH OUR SITUATIONS AND CIRCUMSTANCES--THERE IS POWER IN OUR PRAISE--THERE IS POWER IN OUR PRAISE!! GLORY TO GOD--THANK YOU JESUS--WE KNOW THAT THERE IS POWER IN OUR PRAISE! HALLELUJAH!! We ARE putting TRUTH TO POWER!! IN THE NAME OF THE WAY-THE TRUTH AND THE LIFE=WE WERE CREATED TO WORSHIP AND PRAISE OUR GOD! Amen! Thank You Lord, We Bless Your Name--We Bless Your Name! 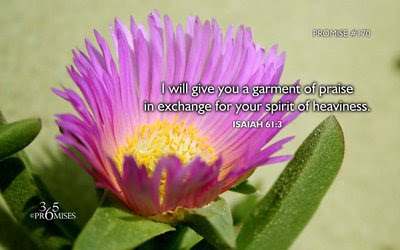 LORD, I CONFESS WITH MY HEART THAT I WILL TREASURE YOUR PROMISE! FIRST DAY IN THE POOL! !